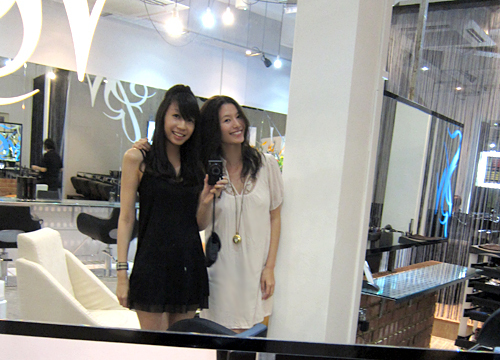 Since some time ago, me & Mag have been receiving questions about where we usually do our hair/which stylists we go to. unsatisfied you can always go back for complimentary styling/a second cut). Prices can be pretty steep though especially if you require frequent maintenance for your hair! 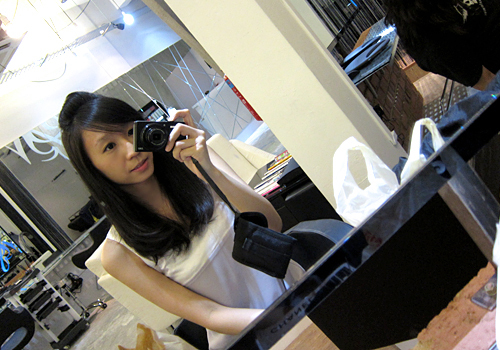 Some of you may also recall me going for a cut and straightening session (here) for $700+. And for styling alone, like what I did for the Nuffnang Awards (here), it was about $200. when it comes to accepting advertorials because we only believe in endorsing a brand that we have personally used and trust. 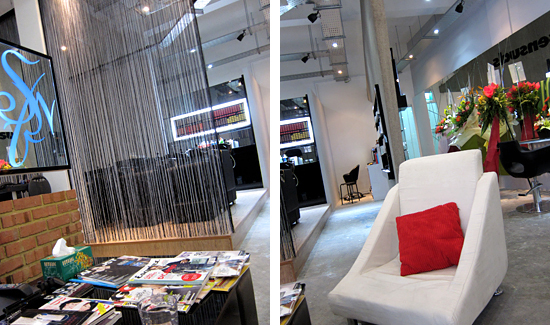 Newly opened at Bugis, Essensuals is basically the branched out, younger and edgier version of Toni & Guy. Best of all, there is no compromise or difference at all in terms of expertise and you get everything at a fraction of the price! 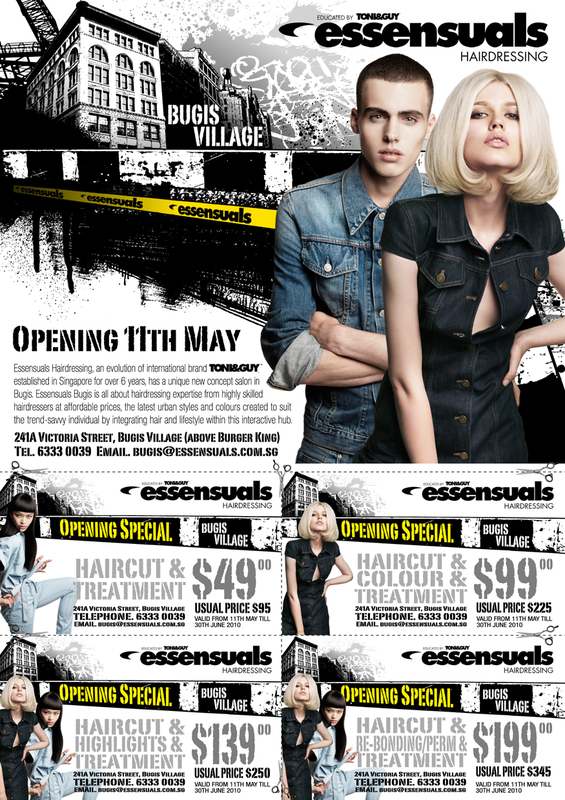 And I say that because what Toni & Guy did was relocate some of their top stylists and hair technicians to Essensuals. Bryan who straightened my hair previously is now style director and Seline the person who styled my hair for Nuffnang has also moved over. If you're interested, do remember to check our upcoming collections for further details/vouchers! 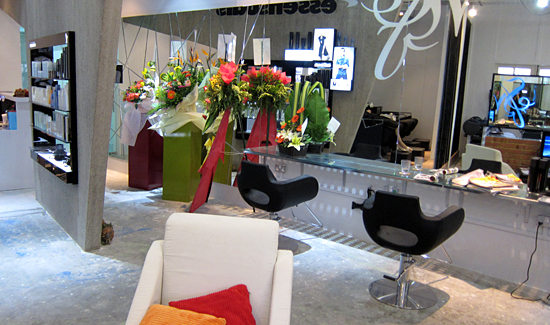 Anyway, since me & Mag were due for a haircut, we decided to pop down Essensuals to have a look/try out the new salon. I decided to trim my hair, curl it and go for the treatment. And because I was whining about how I wanted to blacken my hair, Bryan added a special little semi-permanent ingredient for me! Here's Mag getting her signature alien pouf before Bryan taught her how to style her hair differently. and be rudely shocked into realizing that my hair was merely coated with products to look good temporarily. For Essensuals, while there was a slight difference in hair texture after my treatment, I did notice that results were not instantaneous. On the contrary, what I really liked about it was, the difference became more apparent over time, especially after you've washed your hair. Gotta think long term you know? Anyway, I was so pleased with the results and it was such a good deal, I brought Claire our new model to try it out as well! Claire's hair is naturally wavy and her results didn't show all immediately either. tell me if you cannot see the difference in the pictures below! The first picture was taken you know, during our last post and the second picture was taken 3 days after the treatment. Now that is what I call Princess Hair. 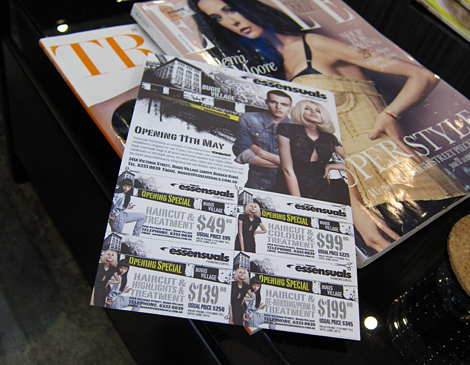 $49 for a haircut and treatment. Am still trying to rush out a couple more... If I've the time, will squeeze in more preview pics! hi! just wondering whether the curls you had actually stay permanent, as in do they disappear after wash or are they actually secure like the permed ones? thank you for your time! Hi Clare, Can I know what type of perm did u perm? Is it permanent? Love the curl in look at the end so much! Hi clare, can i check with u do u know what haircolour brand essensuals is using? & $99 hair cut, clour & treatment applies for all hair length? I am interested in trying out the salon. Just want to check, I will just need to print out the vouchers from your blog in order for me to enjoy the offers? 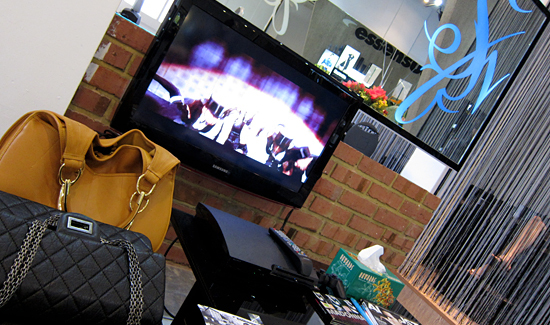 Hi the hair salon looks good maybe wld go there once to try out! Btw when is the next collection cmg up? Excited! haha does anyone know how to reply directly to individual blogspot comments? this is so confusing! anw, previously i tried using straightening tongs to get the single curl effect but it didn't stay for long so my stylist recommended me to get a permanent perm and then blow it in to make sure that it stays like that the whole day :) if i don't blow it in though, it's less sleek and more wavy but i like the look both ways! if i'm not wrong they use products from wella :) and yes the price applies to all hair lengths. i was pretty surprised myself when i found out! next collection coming up really soon. gonna put the preview up in a bit! saw the preview pics, love! Eagerly looking forward for the launch! Clare could you advise a date/time? Fingers cross tight that I won't miss it =_="
hee yes! 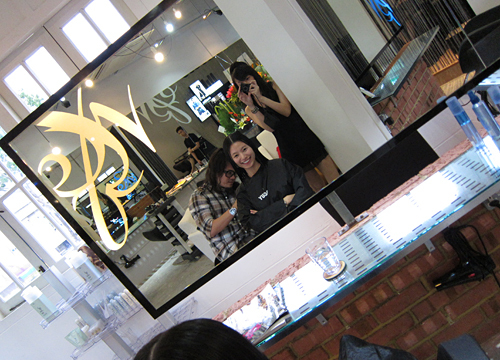 i currently only visit this korean hair stylist but she has difficulty speaking english too! but at least so far i'm happy with what she has done to my hair! :) clare! i love the upcoming collection alot! i like the girly pretty dresses! hope i manage to make it on time to sit in front of the com when you launch so i can get hold of the items! ;)look forward to more preview! hee. :) take care babe! hi clare! u said that "These are some of the current promotions going on, but HVV has managed to clinch exclusive benefits on top of existing offers specially for our customers :)"
so means there will be additional/more benefits for customers of HVV for the upcoming collections? cos i'm thinking of going for a haircut soon, cos i haven't cut my hair since Jan (OMG! ), so I m thinking of whether to just print e vouchers and go down, or wait for HVV to launch, and see what benefits HVV has? Your blog is so interesting and I always read every single part of it. 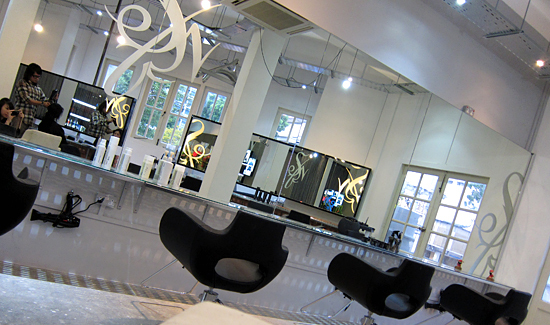 And I'm gonna try the hair cut + treatment as it's about time my hair gets some pamper too! Will wait patiently for the next collection. hi there! was just wondering if the blazer(4th from right) is included in the new collection as well? lookin fwd to check out the hair promos tmr! any chance of you starting a HOH spree anytime soon? hi there! PLS hold backorders for some of the items as they are oos by the time i order :( tks!! u didnt include the abstract pastel chiffon dress(the one in ur preview pic above http://farm5.static.flickr.com/4050/4655743154_6e89bb0e9c_b.jpg ) in this collection ? did i missed out (2nd last pic of the montage) satin shirt in hvv? I must say I was tempted to try it out after looking at the prices. I made an appointment when I saw your post. I was there today, and Seline served me. I was satisfied with my hair cut and treatment. Seline is good with her skills and the lady shampooing my hair was very professional. But that's it. I didn't feel welcomed, nor I felt like I was a customer. I felt like I was intruding into their space on a lazy afternoon. It was really uncomfortable when they spoke in whisper behind the customers' back too. The most memorable event was when the cashier asked Seline if she wanted to give me her name card, and she shook her head. I won't even talk about my handphone being taken by them from the chair. I had to go back up to look for my lost handphone. To conclude, I felt like I was probably treated like a customer who wanted to seize a good deal. Which was kind of unprofessional. I tried to comment on your formspring but it keeps popping invalid. I saw that you're using the canon s90. Could you share how good the camera is? Would you recommend to non cam-savvy peeps? Why did you choose this instead of the ixus 130? I'm so sorry for asking so many qns! Hi Clare, i <3 the very first navy dress in the last row of your pictures! :) is it for sale on your web? cause i checked and saw almost all the clothes featured in your pictures except for the navy blue dress! :) thanks! hey babe i just cant help but notice that you have such an amazing skin.. can you tell me what skin products you use or whats your facial regime is like? thanks so much!!! BABE! i tried essensuals out after seeing your post and im glad tt i did :) you're right abt the treatment. results dont really show on the first day but after i went home and washed my hair it felt so soft ;) thanks so much dear for recommending the place. BTW it would be better if you could share with us more of the places you and mag go to.. esp if you can get discounts for us customers too hahaha. its great tt you guys are promoting brands that you have tried and tested so far. thumbs up babes! sorry for the late reply! have been insanely busy with handling emails and.. many exciting stuff coming up on HVV! anyway yes, HVV has more benefits coming up with Essensuals :) for now, you are entitled to $9 off all existing promotions that are priced above $50. at the moment i'm not intending to open any HoH sprees. sorry about that! we didn't include some pieces because stocks didn't arrive on time and we didn't want customers to go through unnecessary waiting time. they'll be up the next post! carrotcakes: thanks for dropping by to let me know! haha yes, seline has done my hair several times and while she's an absolute genius at what she does, she is also a bit shy which i guess could possibly come off the wrong way especially to a first-time customer! im sorry to hear that you felt uncomfortable though :( please rest assured though that i will send in your feedback. im sure essensuals will take it into consideration! yes i would recommend the camera to non cam-savvy people! im actually pretty horrible with cameras so it's really important that i can just whip it out, aim at what i want and snap without having to toggle with this function or that. and it also works well for me since pictures come out incredibly clear even when i shoot without flash :) hm, i don't know why i chose this over the ixus though.. if i recall properly mag recommended this to me and since im such a simpleton when it comes to cameras, i decided to try it out. agnes: im glad that you liked the experience :) if you're interested, yes we do have some exciting collaborations coming up for our HVV customers and they're all brands that me and mag have used for ages & love!